An official 2011 Sigman Holiday Greeting, and the first-ever two-photo split of the same person (historic!). The first was taken after a benefit show Mr. Seeger did with his half-sister Peggy in Woodstock. I saw an article that mentioned the show while visiting friends in Oneonta, NY (and delivering the Weird Al book as a matter of fact), and, because I knew the show was in a small space, assumed the show was sold out, or at least the $100 VIP tickets, which included seats in the first five rows and a postshow meet and greet. When I found out tickets were still available, I told my friend and he and I went all in for the VIP seats. I began hoping there wasn't going to be a surprise appearance from Princess Wow. When we took our seats, the woman to my left seemed stunned that I was in the VIP section and, in fact, made a point of asking how I got the tickets. When she asked me, I assumed she was saying something because she was as surprised as I was that it didn't sell out immediately. But I soon realized that she was completely baffled as to how someone who looked like me would be sitting next to her in the VIP section. This was confirmed when she said, "This is the VIP section, you know." And during intermission, my slowly accepting rowmate turned to me and said, "It's so nice to see someone your age enjoying the show" before rattling off her protester cred and bemoaning the state of today's wayward youth. I thought Woodstock was supposed to be kind to people with long hair. Anyway, the show was good, but as it got later, we began to wonder if Mr. Seeger would, in fact, be up for meeting and greeting. It took him awhile to come out, but he eventually set up shop next to the snacks and began taking pictures and signing autographs. One dude must have brought about 25 things for him to sign, which seemed to be a little bit of overkill ( I brought two, and I felt bad about even bringing that much). He was at least breaking it down into small groups of items, so we had time to sneak in and get our stuff done. I got my photo done first, but then we lost our place in line when the other guy brought more stuff over to sign. Finally, as the clock inched toward midnight, I took my friend's picture with Mr. Seeger and we were on our way. Unfortunately, we were in such a rush to get going and let the nice 91-year-old man get his rest, that we didn't realize Mr. Seeger's eyes were closed in the picture. But thanks to the magic of Photoshop (and thanks, Karin! ), we saved that photo. I wasn't planning on getting another photo with Mr. Seeger, but once I saw him seemingly happily taking photos with people, I figured I might as well. Of course, because I am not wont to interject myself into people's conversations and crowd people, I wound up getting up to Mr. Seeger just as the woman who was with him told him to tell her when he'd had enough, and he replied, "Um, I think I'm about ready." But I quickly handed my camera off to the woman and, voila, Pete Seeger photo #2 is born. I prefer standing shots to the squatting variety, so I'm pleased with the retake, though I like the first one just fine. 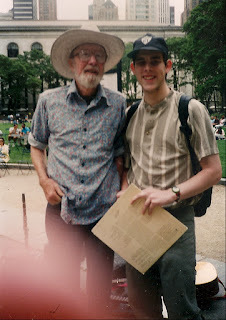 Actually, it's Pete Seeger photo #3, as the first one was taken by my sister in Bryant Park about 15 years ago at a tribute to Martin Luther King Jr. at which there were I'd say about 20 people. And now, since my sister recently gave me the photo, here's another shot of Pete and me, meeting for the first time. Ah, memories. Bonus Sigman trivia fact: I was on local Ithaca TV getting Arlo Guthrie to sign the very same album I'm holding in the photo. I would also like to note Mr. Seeger's love of the paisley blue shirt through the years. And, finally, I would like to declare that I will no longer bother Pete Seeger for an autograph or photo. He has given me enough. So that's it for the Year in Celebrity Pictures 2011. Onward! An official 2011 Sigman Holiday Greeting. That's probably the earliest a Holiday Greeting photo has been taken, but once I saw how the picture came out, I was pretty confident this one was going to make it into loved ones' mailboxes in December. This is Mr. Yankovic's pose for a lot of his photos, so, seeing him take the pose with others as I waited in line, I had to be prepared with an appropriate look of my own. This is what I came up with. A winner. I left work early to get to the book signing on time and decided to just level with my boss and tell her instead of making up some fancy excuse. She didn't seem to mind. Unfortunately, I should have left a little earlier, because the store ran out of books (or so they said) and I had to settle for getting bookplates signed, which they would then affix to the books when they came in. Then I could pick them up and all would be right with the world. Until the books didn't come in when I was told they would, and when I arrived at the store because I needed one that day because it was a birthday gift and I was about to get on a bus heading upstate, I was told it wasn't going to happen. But I noticed that there were, oh, about 10 signed copies of the book on a shelf behind the counter. Hmmm. So, what I assume happened was that people ordered signed copies online, and instead of giving the books to the people who were actually at the signing, they used those copies for the online purchasers. Interesting way to reward people who physically come into your store for an event. Shouldn't the lazy people have to make do with bookplates instead of the actual people in the store? They eventually found one unsigned copy in the store, so I got that one and had the other two mailed to me. I was glad they were able to do that, but I still have my doubts about the place. Bookends may be a shady store (they also sell marked-up signed copies of a book after an event, something I've never seen a bookstore do), but they do get props for having a dude in charge of taking photos and for making two Sigman Holiday Greetings possible (the Maureen McCormick Holiday Greeting was also a Bookends shot, though at their old store). So, a begrudging thanks to the people of Bookends. I'm not sure I've ever met a nicer celebrity than Dave "Gruber" Allen. The first time I met him was before a Knitting Factory show in 2004, when the Naked Trucker and T-Bones were the comic relief at a benefit show during the Republican National Convention that also featured Serj Tankian from System of A Down, Tom Morello from Rage Against the Machine, Steve Earle, Michael Franti and Spearhead, and Boots Riley from The Coup. He could not have been happier to sign my Freaks and Geeks DVD yearbook (I think he might have been the first to sign it) and talk about the show, and we had a nice conversation. Unfortunately, there was no one around to take a picture at the time. I thought about asking a stranger to take a picture after the Naked Trucker and T-Bones were done with their set (which was awesome, if slightly confusing to the more earnest rabble rousers in attendance), but I chickened out. Which brings us to the Cinematic Titanic show in Newark last November. I'd read that Mr. Allen was the opening act for the show (a live--and very funny--version of Mystery Science Theater 3000), so I got my ticket to the show (thanks, Josh!) and prepped for my Gruber photo. Alas, he didn't make the trip to Newark. Foiled again. But since Trace Beaulieu and Joel Hodgson from MST3K made appearances in Freaks and Geeks, and J. Elvis Weinstein was a writer for the show, I added them to the yearbook, making the evening at least a partial success. And Cinematic Titanic is awesome. I never watched Mystery Science Theater 3000, but I loved the live show. It's essentially just five really funny people mocking a really bad movie, but it's two hours of almost nonstop laughter. Check it out if you can. They're back in Newark in March. Anyway, now it's September 2011 and the Cinematic Titanic gang is at the Best Buy Theater in NYC. I do some research to see if Mr. Allen's been opening shows lately, find out he has, and buy my ticket and hope for the best. When I see him setting up microphones, I get a little giddy. He does his opening act thing (funny), the Cinematic Titanic crew riffs on East Meets Watts (very funny), and soon it's time for the postshow meet and greet. I don't really have anything for the CT crew to sign, but I figure Mr. Allen will be in the meet and greet room. As I'm standing on line, I see him there, but a few minutes later I notice he's gone. D'oh. I get my ticket stub signed and resign myself to trying again next time. Then, as I go up the escalators, I see Mr. Allen standing by the door and thanking people for coming as they head out into the night. Hooray! I then get my stuff out (8X10 screen shot from the "Eighteen" scene and my Naked Trucker and T-Bones CD) and wait my turn. As soon as I show him what I have to get signed, he gets super-excited and tells me that I've made his night. We talk about the Knitting Factory show and some other Freaks and Geeks stuff, and then I hand my camera to some dude to take the picture. There are two pictures because after the first one, Mr. Allen said, "OK, now let's take another one where we're shaking hands." So we did. Then he thanked me again and I went off into the night. Coolest guy ever. Long live Dave "Gruber" Allen. Burt Young was cool, but this is the reason why I stayed up all night in Milwaukee so I could catch the bus that would take me to Chicago to catch my plane to LaGuardia and then my ride to Parsippany. I will go through a lot to meet a Griswold, or at least an OG Griswold (I would make no such effort to meet the other living Audreys; Dana Hill [RIP] had Zabka as an on-screen boyfriend, so I might've done the same for her). My Vacation VHS now awaits only Beverly D'Angelo's signature to reach completion, or as close to completion as I plan to get. Ms. Barron was very nice and totally into the signed VHS. She asked about where I got everybody else and did her best not to say anything disparaging about Randy Quaid, saying, after careful deliberation, "All that stuff you read about him, yeah, that's pretty much him." She also succesfully upsold me on the copy of her Vacation script that she was selling. I think I bought one on eBay at one point, but this one was a copy of her very own script, with her notes in it and some extra material she added. How could I not buy it, right? Anyway, she apologized for there being a few missing pages of the bonus stuff because of a copying snafu but she took my e-mail address so she could send me the PDFs later (yeah, that's right, Dana Barron sent me an e-mail...not bragging, just saying). She also seemed very into the idea of me selling the signed script on eBay and suggested not personalizing it so I could do so, but I told her I was keeping it for myself. I would once again like to pat myself on the back for not, to the best of my knowledge, saying anything completely ridiculous to her while on no sleep. I did take five pictures with her (partially because of flash-related issues), but, hey, meetings with Griswolds (and Griswold relatives) need to be properly documented (come to think of it, none of the other ones were, and that makes me a little sad). The one above was #2, and I think we make a swell couple. A dream fulfilled. I would like to thank the oppressive heat wave for giving me the kick in the pants needed to get out of town and finally see the accordion master live and in person. And to give me the opportunity to further develop my love for the city of Milwaukee (this was the first of three visits to the city in 2011). If Mr. Contino decides to continue his Festa Italiana run in 2012. I might just go back again. C'mon, let's all go! Save the dates: July 19-22, 2012. And here's one more great Contino moment on live TV. You can't shake the square-shootin' squire of the squeezebox. Celebrity: Tony Clifton, best known for his storied career as a first-rate lounge singer and world-class entertainer, or for being the alleged alter ego of Andy Kaufman and/or Bob Zmuda. You make the call. "Celebrity" is, I suppose, stretching it here, as Mr. Clifton (or Mr. Zmuda if those alarmingly persistent rumors are true) isn't exactly a household name. But, really, I blame that on the households. Shame on you. In any event, the two Tony Clifton shows I've been to have been two of the most entertaining nights I've spent in clubs, and this will be as close as I get to Andy Kaufman, so this is easily one of my favorite pictures of the year. Mr. Clifton was a pure gentleman, reminiscing about the show he did at Santos Party House in NYC (I'll call it about three hours long, ending around 2:30 with maybe a tenth of the people making it all the way through) and filling me in on the Atlantic City show I missed. Sure, I probably could've found a better way to spend my money than on an autograph from and picture with what is (allegedly) a comedy writer in a costume, but I have no regrets about my decision. I will sur-veeve. The last entry (timewise, of course...plenty more photos to come) in The Year of Celebrity Pictures 2011, and the one with the least prep time. I was doing my laundry on a Sunday afternoon and surfing the Web as I waited for my clothes to dry. Every now and then, I check the Twitter pages of Freaks and Geeks cast members to see if they're in New York. Yes, I know that sounds weird and random, but, c'mon, does it really surprise you at this point? I started doing it when John Francis Daley (Sam Weir) was in town promoting Horrible Bosses (alas, I missed him) and did it again a few months back when I saw that Martin Starr was in a movie that was coming out. I wanted to see if he's be in town for the premiere, and it turns out he was... when it premiered three months prior at the Tribeca Film Festival. Foiled again! Anyway, I was looking at his Twitter feed when I saw a Tweet urging people to come see him do one or two songs with Common Rotation at The Living Room at 8 pm on November 27. Then I realized it was November 27. And it was 4 pm. So I went to the laundromat to get my clothes, did a few more things around the apartment and then headed into the city. I got there around 7:45, and after an enjoyable set by Common Rotation (Martin rapped--yes, rapped--on two songs and joined in on the "Yeah"s in a cover of "We're Not Gonna Take It"), I added another signature to my Freaks and Geeks DVD yearbook. I wasn't going to bother him for a photo (he was talking with friends), but as I left I decided to bug him and he was happy to pose. Unfortunately, right after I asked, a deranged, toothless guy approached, looked at us and the women who were with Martin, and said, "What's up, assholes?" Perfect. One of Martin's friends took a photo of the three of us (I deleted it) to try to get the guy to go away, but he lingered, so I went on the other side of Martin and got the photo above. An exciting moment, as it was my first photo with a main F&G cast member (I've met a bunch but never asked for a photo with any of them). And a rare time when I can honestly say I am grateful for Twitter. How can you not love Ernest Borgnine? And how could I pass up an opportunity to get a signed photo from Marty and a picture with the man? I don't know, but I did at a previous Chiller. When I saw he was booked for a return engagement, I saw a chance to right a wrong. And I'm glad I did, because he was awfully kind and looked downright jubilant in every photo I saw him take with other Chiller attendees. At 94, he's the oldest of this year's crop of celebrity pictures (though, not surprisingly, not by very much), and it was a genuine thrill to sit next to him. I love Marty so much, perhaps a little too much. The successful conclusion of another multistate quest to get something signed by someone most people rarely, if ever, think about. Sure, I could've tried to score a ticket to see the eventual World Champions play an NLCS game, but who wants to do that when you can get your Champ Kind bobblehead signed and see T-Bones reborn in a hotel comedy club in Illinois, while sitting next to a guy who thinks it's fine to actively converse with the comedians during their acts? Right? I'd already taken photos with each of them separately, but I figured a group shot with the youngest of the families (or, in my case, the younger) was worth giving still more money to the Bradys. They're both very nice, as all the Bradys (and Cousin Oliver) have been. They were raised right. I'd seen Mr. Murphy many years ago, and even got an autograph (after a show in Central Park with Joe Louis Walker, Ike Turner, and Scotty Moore, if memory serves), but I didn't get a picture with him. A few years ago, he suffered a stroke, and for awhile it looked like his playing days were over. But he worked his way back and now does a limited number of shows a year. I missed one chance to see him (on the day of the great Five-State Bowling Tour), and I didn't want to let another one pass by. So I went to the late show at the Blue Note (first time there), and though I got there a little late, I managed to have a decent view from the bar to see Mr. Murphy play with the Nouveaux Honkies. He's understandably a little slower than he used to be, but it was good to see him back up on the stage. I wasn't sure if he'd be up to signing stuff after the show, but he was, so I got a poster signed and then had his manager take this picture (this is the second attempt, I believe). All acting jokes aside, he might be my favorite Blues Brother (he's close with Cropper), so it's cool to have this photo. One of two photos taken that day in which I don't look nearly as tired as I feel. On the morning this was taken, I was in Wisconsin, having stayed up all night after seeing Cheap Trick and partaking in most of a late-night bingo session so I could catch a bus that would take me to the airport in Chicago, from which I would fly to LaGuardia and then proceed directly to Parsippany courtesy of the McGrath Shuttle Service. It was a long day. But I met Paulie (and someone even cooler...stay tuned), so it was worth it. In retrospect, I wish I had brought a sign that read "Bruce Springsteen" on it so we could've recreated that scene in Back to School, but so be it. I'm just grateful that in my groggy state I didn't start rattling off his lines from the climax of Rocky V (such as "This man, he spit blood for you" and "You know what Tommy--you're a piece of garbage" and "Should've left him on the street where we found him, Rock"). He was awfully nice, and apparently so willing to please his fans that he will gladly re-create Damone's five-point plan while you record it for YouTube posterity. I can't imagine asking someone to do that, but, hey, good for him for going the extra mile. I have no idea who the woman in the picture is. Maybe he knows her, maybe not. All I know is that right before the picture was taken, he told her to get in the picture, too. Awesome. Oh well. A small price to pay for the greatest inscription ever. I wasn't sure I was going to go for the photo, but, you know, we former journalists like to stick together. And she was in a movie with Zabka, so $10 is a small price to pay to be one degree from Zabka. Finally some forward progress! There were three 600-plus-page books in this lot, but I mixed in some shorter, lighter stuff, and I finally came up with a mix that pushed me upward on my daily average rather than down. Granted, some of this reading was done very bleary-eyed (including one night in Milwaukee where I didn't sleep and read a James Baldwin book in a bingo intermission), and there were a few short stories that I gave up trying to understand about halfway through (least favorite book of the year! ), but, hey, I persevered, so let's all applaud me, OK? The page count stood at 21,567 after 301 days, making for an average of 64.4 pages. I'm hoping I can keep this forward movement going and end the year on a high note. The final books are sitting in a pile, and I'm confident I will claim victory at year's end. "I have no desire to do anything. I am afraid of nothing and I want nothing. I wait like a psychopath in a game of dodge-ball: breathing quickly while the fools decide which one will throw at me next, and jumping aside for no reason except that I like being in the middle. And there is really no reason for being in the middle. Why not quit altogether and be down outside the circle? I have no idea what to say, I don't know when I'll see you again and I don't believe in anything beyond the next ten minutes. People keep calling me and telling me what a great friend I am. Everybody is looking for someone who can stand up in the wind. It is lonely standing up and crowded lying down. I refuse to be an anchor for other people's dreams--but then I refuse to anchor mine to anyone else. So I have no choice but to stand up and piss into the wind. Pardon my vulgarity." When you're 23 years old?